Welcome to Week 2 of the Spring 2018 edition of The One Room Challenge HERE! Hope you had a chance to check out the featured designers and their projects, I had a hard time choosing a favorite, collectively they bring so much design inspiration to the event. One Room Challenge™ is a widely anticipated biannual event every April and October. Each round, twenty design bloggers take the challenge and transform a space. Every Wednesday, the designers document their process while sharing their sources and professional advice over six weekly posts. What is My Role in the One Room Challenge? As a guest participant this season, I am making over our basement bar space. I apologize to all who were looking forward to seeing our “cigar room turned wine cellar” challenge. After talking to several companies, I realized it would not be possible to complete the room in 6 weeks. BUT…do not dispair (with a bit more advance planning)….I will be back for the 2018 Fall edition of the ORC featuring the wine cellar challenge! YAY!!!! Painting the walls, ceiling, and trim. My choice for cabinet color is to stay with a dark tone. Grays and blacks are my first color choice. Love the nails and netting on these bar cabinets. I think black cabinets are a beautiful choice for a bar. Love this slate color as well. 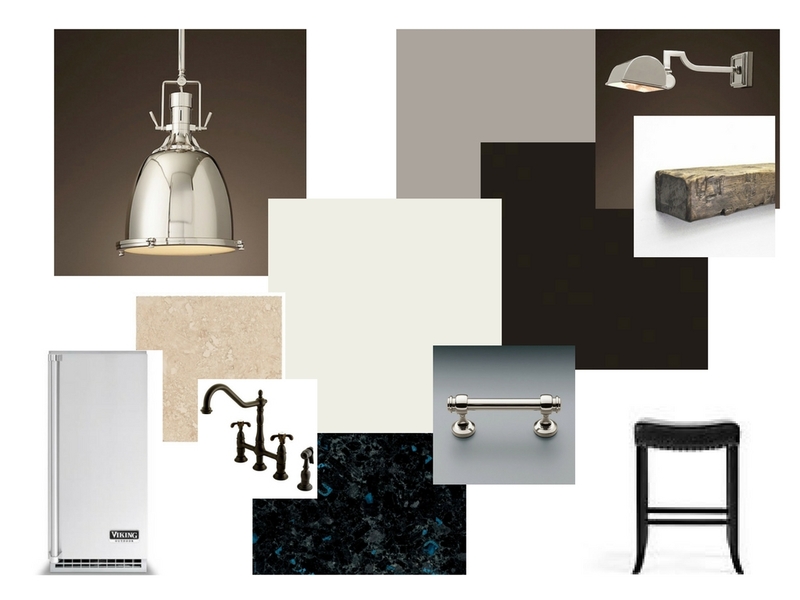 A design board is a great way to visualize the color choices and items being used in a project. My design board includes the elements of my project. My finish choice for lighting and hardware is polished nickel. The polished hardware will give the room an elegant and slightly formal feel. The travertine tiles are cream colored with a touch of gold. Bringing in black bar stools will create a nice contrast. The granite countertops have deep blue speckled in the stone and will look fabulous with dark gray cabinets. Thanks for visiting, and I will see you next week! Next Post Visiting the Cherry Blossoms in Washington D.C. The bar update is going to be fabulous. I love the polished nickel mixed with the darker cabinetry so much. Thanks Joan! That’s so sweet of you!